Ewan McGregor stars in this fantasy adventure based on the characters created by A. A. Milne and E. H. Shepard. 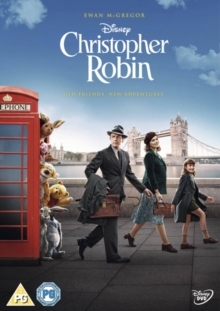 Now grown up and living in the city, Christopher Robin (McGregor) finds it difficult to find time for his family while working as a businessman. Just as things are starting to get on top of him, his childhood friend Pooh (voice of Jim Cummings) appears looking for his help having lost all of his friends. The pair head back to the Hundred Acre Wood where Christopher helps Pooh locate his missing buddies and is reunited with Tigger (Cummings), Eeyore (Brad Garrett), Rabbit (Peter Capaldi) and Piglet (Nick Mohammed) once more. However, the animals soon see Christopher has lost his sense of imagination, and, when he heads back to the real world, Pooh and the rest of the gang decide to repay Christopher by helping him rediscover his love for life.